Losing a friend or loved one is a very challenging time indeed, and sometimes it is necessary to show exactly how sympathetic you are. 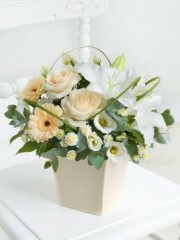 We at florists Edinburgh offer a number of very tasteful designs which would be ideal for showing your feelings - all of which are available for you to browse through on our website. However, if you wish to add a more personal touch to your message of gorgeous sympathy flowers, then you can take advantage of our bespoke service; you can completely create or customise one of our designs. We also have a number of gifts for you to purchase along with your beautiful sympathy flowers - such as bottles of luxurious wines or champagnes, boxes of decadent chocolates, balloon with personalised messages on them, or even soft teddies/teddy bears. 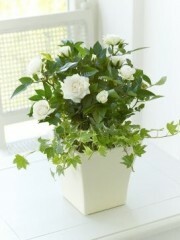 All of these would be excellent as a possible gift for you to cheer up the bereaved person. As well as funerals and sympathies, we also cater to a number of other occasions - such as weddings, engagements, anniversaries, parties, retirement and many more. 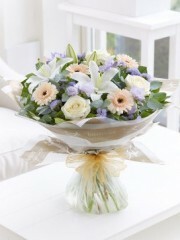 No matter what you require, we at florists in Edinburgh can always provide stunning sympathy flowers for you. Edinburgh flowers are also of the highest possible quality, evident in the fact that we have our gorgeous sympathy flowers supplied directly from the source in Holland, where we feel they grow their flowers to that same extraordinarily high standards that we ourselves demand. 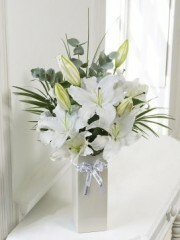 To further increase the lifespan of your lovely sympathy flowers we have fresh deliveries up to 3 times a week. This is all in the interest of ensuring that you as our customer receive the most possible enjoyment out of your flowers, and therefore your recipient does too. Your sympathy flowers will last a wonderful length of time, ensuring that your friend or loved one who suffered a bereavement know that your thoughts are with them. Florists Edinburgh have several delivery options all of which have been introduced in the interest of suiting your needs the best we can. There is what can be considered the standard option; next day delivery. 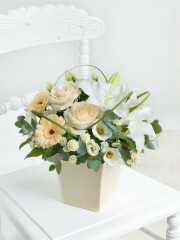 This gives you the option of specifying whether you would like your elegant sympathy flowers delivered before or after 1pm (morning or afternoon). Edinburgh flowers also offers you our same day delivery service - by far our most popular one, as long as you place your order before 3pm, you can be certain that it will arrive the exact same day. Excellent if you are prone to forgetfulness. 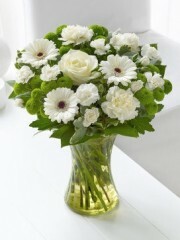 Both of these services are carried out by our experienced and enthusiastic delivery drivers, who are committed to arriving on time with your beautiful sympathy flowers in perfect condition. We also give you the option to place your orders in advance, and while this is not possible with regards to sympathy flowers, you can still order wedding or party flowers weeks, months or even a year ahead of schedule. The last service we offer in the international delivery. 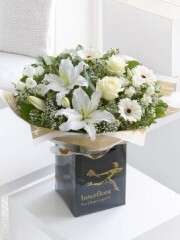 As well as delivering your stunning sympathy flowers to anywhere in the UK, you can also send them to over 140 countries abroad through the Interflora network. It is irrelevant where your friend or loved one is, you can rest assured that they are always within range of a gorgeous bouquet of sympathy flowers from you. We at Edinburgh flowers combine over 40 years of experience and the skills of our experienced florists to bring to you the very best in customer service. Should you have any questions or queries please do not hesitate to contact us via phone or email.